A friend of mine, whilst renovating her house in the 1970’s, discovered that newspapers had been used as wallpaper in one of the rooms. One of the pages contained a short article about the family of giants who lived in the Nar Nar Goon- Bunyip area. Unfortunately the page was damaged when she tried to remove it and I began to doubt my memory of the article, so I was thrilled when I came upon a number of similar articles written in the early 1900’s about the family. I assume that Snell Road in Nar Nar Goon North was named after the family or their descendants. Mr. William Snell and his wife Elizabeth (nee Snell, possibly a cousin) were married in England and emigrated to Australia in the 1860s. William was a baker and Elizabeth was the daughter of George Snell who was also a baker. Both William and Elizabeth were of “normal dimensions”. In Australia they settled in the Bunyip region and had five children. Three of the children were very large, both in weight and height. The other two were much smaller and one is even described as slight. Clara Snell was the largest of the three. Some reports state that she was over six feet tall (183 cm) and weighed 40 stone (254 kilos). This is in a time when the average woman was approximately 5’2″ tall (160 cm). 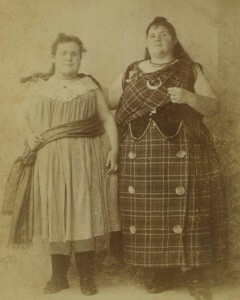 Clara’s sister Anna was somewhat smaller weighing in at only 28 stone (177 kilos) and her brother Thomas at 25 stone (158 kilos). 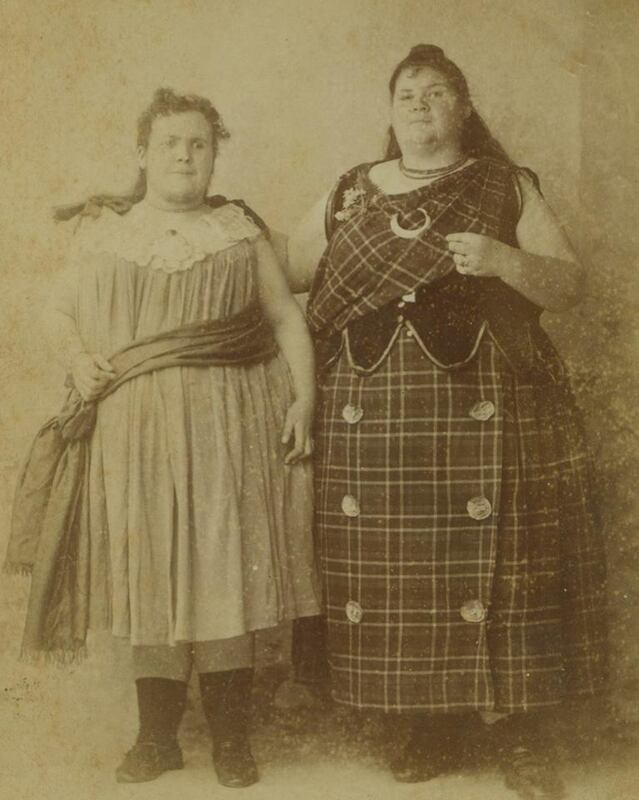 In 1886 the owner of the Melbourne Waxworks museum became aware of this unusual family and approached their father with a plan to start exhibiting the children as “giants”. Their father William embraced this idea and there is some question as to whether he pushed the children to keep overeating. They certainly became famous and did a traveling show around Australia. In some photos Anna was only nine years old which would have made Tom eight and Clara fifteen. The girls would sing and play the piano and people flocked to see them. The girls are describes as being light on their feet and loved to dance. They often traveled by train but had to sit in the guard’s van as they were too large to fit through the normal doors. A buggy was too small to accommodate them so they used a horse and dray. In 1888 they went on a world tour and called themselves The Australian Giant Family. They were exhibited in the UK, Europe and then America where they performed alongside Buffalo Bill and Chief Sitting Bull. On Clara’s passport under the heading of occupation she listed herself as a giantess. The girls appeared to enjoy being on show but Tom left as soon as he turned 21. Tom became the local storekeeper in Nar Nar Goon and lost most of his weight. Clara and Anna continued to exhibit themselves doing a second world tour and earned enough money to purchase the Robin Hood Hotel near Drouin. Both girls married although I can find no mention of Clara’s married name. Anna must have had a sense of humour because she married a man named Mr. Small. Both Clara and Anna remained large until they died. Clara died in 1914 at the age of 41, Anna in 1930 at the age of 54 and Tom died in 1949 at the age of 72. All three are buried in the Bunyip Cemetery.